In common parlance, the term “Air Force One” refers to those Air Force aircrafts specifically designed, built, and used for the purpose of transporting the President of the United States. But in actual sense, it is an air traffic control call sign of a United States aircraft carrying the president. The “Air Force One” call sign was created in 1953 when a previous call sign coincided with the one a commercial airline flight was using when the Columbine II carrying President Dwight D. Eisenhower entered the same airspace. The Presidential aircraft is a prominent symbol of the American presidency and its power. Since 1990, the presidential fleet has consisted of two Boeing VC-25As. These are specifically configured, highly customized aircrafts from the Boeing 747-200B series. The Air Force plans to procure the Boeing 747-8 to be the next version of Air Force One. The Air Force One is considered to be a “mysterious aircraft” as no one knows anything about some parts of the plane and it is a crime to ask questions about the secret parts of the plane. Its features as are presented to you in this article are just what has been described by those who have been on board as per how it looks inside and outside, but till date, there has never been an official confirmation about its interiors. Even if any official knows all details about it, then the person is prohibited to reveal it to anyone. It flies with a speed of 700 miles per hour from the altitude of 45,100 feet, thanks to its General Electric CF6 (GE) engine. Like any other normal Boeing 747, this plane also has three decks – Upper, Middle and Lower. The information about the particular deck in which deck President is travelling is only known to the flight crew. Journalists enter from the rear door of the aircraft and they are taken to the middle deck. The press area of this aircraft looks like the first class section of other aircrafts. And besides the press area, there is a staff area, conference room, dining area, kitchen, presidential suite, office, communication room, lounge, cockpit and sleeping facility for the cabin crew in the middle deck. The plane has a lot of technology in it. Its on board medical facility has an extensive pharmacy, loads of emergency room equipment and even a fold-out operating table. The plane also has a staff doctor among its crew who travels with the president wherever he goes. On every mission, the plane is prepared for a wide range of potential medical emergencies. There is an ICU and Ventilator unit. There is also a huge medical room in the aircraft that contains all sorts of medicines. Another remarkable feature on the plane is its extensive installation of electronics. It has 85 on board telephones, a collection of two-way radios, fax machines and computer connections. It also has 19 televisions and assorted office equipment. The phone system is set up for normal air to ground connections and secure lines. The president and his staff can reach just about anybody in the world while cruising tens of thousands of feet in the air. The on board electronics include about 238 miles of wiring (twice the amount you’d find in a normal 747). Heavy shielding is tough enough to protect the wiring and crucial electronics from the electromagnetic pulse associated with a nuclear blast. To avoid dependence on any airport’s facilities, which could be a security risk in itself, the plane has its own retractable stairways, for the rear entrance and the front entrance. These stairways open onto the lower deck, and crew members and staff climb internal staircases to get to the upper decks. The plane also has its own baggage-loader. The baggage loader is also capable of protecting the US President from any harm. 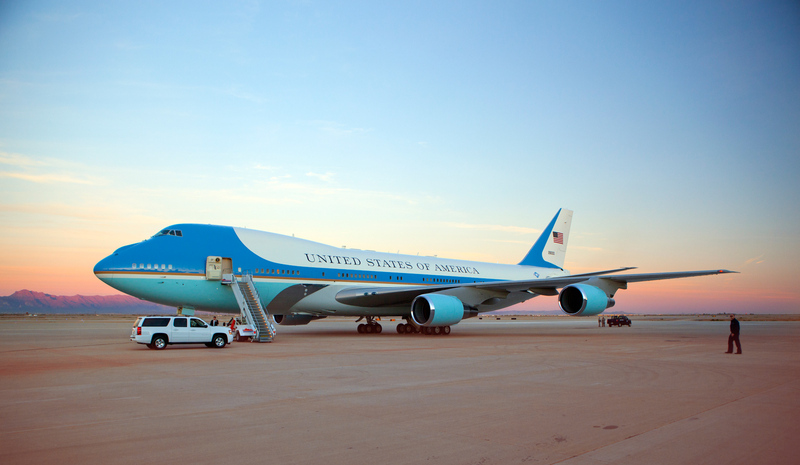 The Air Force One is equipped with the fuel capacity of 53,611 gallon. If the fuel tank of the Air Force One is full, then it can travel half of the world. It also has an in-flight refueling connection. This gives it the ability to stay up in the air indefinitely, which could be crucial in an emergency situation. Even though some of its advanced avionics and defenses are classified, it has been designed to withstand an air attack. Among other things, the plane is outfitted with electronic counter measures (ECM) to jam enemy radar. The plane can also eject flares to throw heat-seeking missiles off course. The plane may look like a normal Boeing aircraft, almost as tall as a six-storey building, the aircraft is so strong that there won’t be any impact of even a nuclear bomb was targeted at it. The crew prepares meals in two fully equipped galleys. They store a large amount of food in freezers in the lower sections of the plane. The crew is equipped to feed about 100 people at a time, and the storage area holds as many as 2,000 meals.